$1,599.90 & FREE Shipping on orders over $59. Do you want to add a Glycol Pump Kit? Do you want to add a gallon of Glycol? If you wish to add more than one Glycol Pump Kit to your order, please edit the quantity in your shopping cart. If you wish to add more than one gallon of Propylene Glycol to your order, please edit the quantity in your shopping cart. 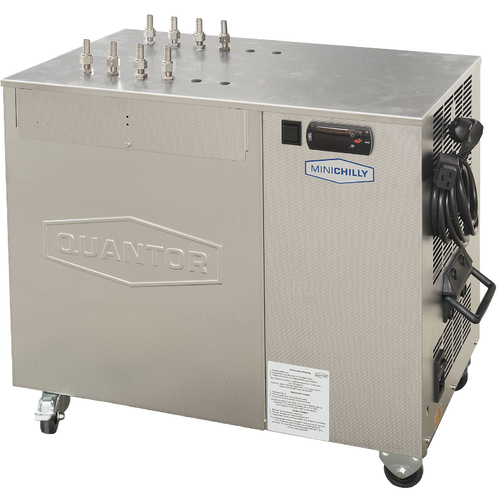 The German made Quantor MiniChilly is an ideal solution for nano breweries looking to chill up to 4 fermenters at once. The idea of the MiniChilly is that for each fermenter you want to a chill a pump kit is added. A pump kit (GLY355) includes a submersible pump that is placed in the cold bath of the Mini Chilly along with a digital controller that is placed next to your fermenter. Vinyl tubing is included to make the connections. The digital controller includes a thermal probe that should be inserted into a thermal well in your vessel or can be taped to the outside of the vessel if you don't have a thermal well. The digital controller then measures the temperature of your tank and turns the submersible pump on or off to cool the liquid in your vessel to the desired set temperature. In this way each tank can be set at different temperatures. 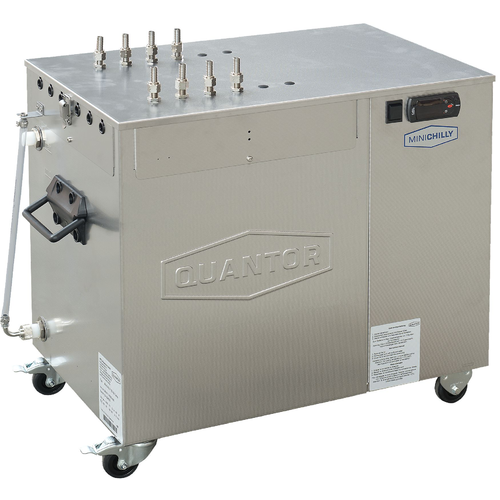 The MiniChilly is made by Quantor/Kreyer of Germany who is the largest manufacturer of glycol systems for breweries and wineries in the world. Made with high quality manufacturing and components, the MiniChilly is a durable system for many years of problem-free brewing. The unit features a stainless steel case with stainless 3/8" barbs in the top that allow for a clean connection of the vinyl tubing that will run from each pump to each tank. The MiniChilly is able to chill its reservoir down to 21°F when a 30% glycol solution is used. The compact size and included casters make it easy to move around the brewery when needed. Spike Conical with Optional Cooling Package - Because the optional Spike cooling system includes a pump and controller you will not need to buy a separate Glycol Pump Kit. Speidel Tanks with Optional Cooling Jackets - You will need one Glycol Pump Kit for each tank. 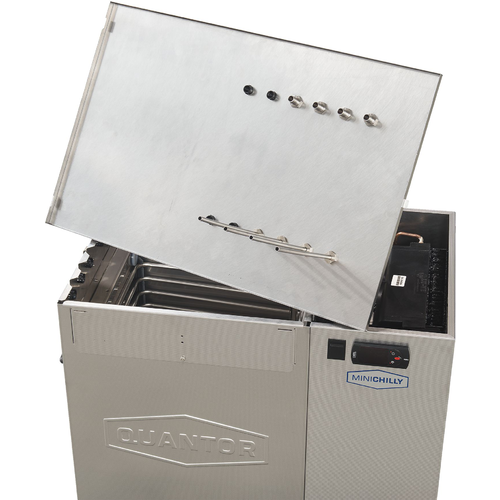 Blichmann Fermenators with Optional Cooling Coil - You will need one Glycol Pump Kit for each Fermenator. Many chiller ratings are based on the theoretical power of the compressor, while the cooling capacity of the MiniChilly is rated at a realistic ambient temperature. This is much more useful for predicting the MiniChilly’s performance in real world applications. Of course, you could cool a greater number of smaller tanks but you’re ultimately limited to the 3 connections. Actual cooling capacities will vary based on the insulation of the tank. For the examples below we assume neoprene or better. Up to 11 1bbl (31 Gallon) tanks fermenting at 68°F in 80°F ambient temperature. For every fermenter you want to cold crash remove 4 fermenting fermenters from the capacity. Note there is only hooks ups for 4 fermenters. In order to hook up the MiniChilly to your fermenter or tank's cooling system, you will need 4 lengths of tubing per pump. All tubing connections should be secured with hose clamps.